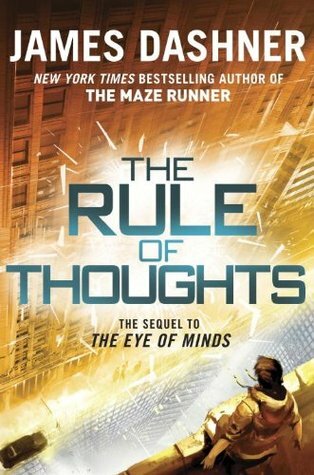 From the New York Times bestselling author of the Maze Runner series comes The Rule of Thoughts, the exciting sequel to The Eye of Minds. Fans of the Divergent series by Veronica Roth and The Hunger Games will love the new Mortality Doctrine series. Michael completed the Path. What he found at the end turned everything he’d ever known about his life—and the world—completely upside down. He barely survived. But it was the only way VirtNet Security knew to find the cyber-terrorist Kaine—and to make the Sleep safe for gamers once again. And, the truth Michael discovered about Kaine is more complex than they anticipated, and more terrifying than even the worst of their fears. Kaine is a tangent, a computer program that has become sentient. And Michael’s completing the Path was the first stage in turning Kaine’s master plan, the Mortality Doctrine, into a reality. The Mortality Doctrine will populate Earth entirely with human bodies harboring tangent minds. Any gamer who sinks into the VirtNet risks coming out with a tangent intelligence in control of their body. And the takeover has already begun. The Mortality Doctrine series explodes with creativity with The Rule of Thoughts. Michael barely completes the Path, with the help of his friends Sara and Bryson, up to the end where he ended up solo. What Michael discovers will change his world forever, and possible everyone else’s too if Kaine isn’t stopped. But how can they stop Kaine, the tangent who’s artificial intelligence has grown to unlimited possibilities. When Michael wakes up and finds his whole world and being is twisted in a nightmare, he knows he must find Sara and Bryson in the real world because they might be in danger. He regrets getting them involved, however it is too late to turn back now. They need to find Agent Weber and the VNS for help. On the run with no one to trust, they pursue a dangerous adventure where lives are at stake. Sometimes I find it so hard to write a review for a series that demands your complete attention. Some stories should be discovered with little details given so you can enjoy and dive completely into the make believe world….and this story is one of them. There is betrayal. Hacking skills will be tested to the extreme. The characters in this story will grab you, and hold on tight. Their complete trust in one another…Michael, Sarah, and Bryson…will give you hope that they will succeed in this adventure. They support each other and make decisions together, the three best hackers just can’t fail. I love the complexity of this world created by Dashner. He truly has a unique imagination that I just adore. With twist and turns and overwhelming *gasp* moments, this story accelerates in speed as soon as you read the first page. It’s difficult to put down. With the third story now out, I will be starting it tonight because I just can’t imagine how the story will go. I'm super curious now especially since I liked his previous series.